US and Nato Forces are Present in Afghanistan from almost 9 years now and whichever Operation they launched till now in Afghanistan against the Afghan Taliban don,t proved to be very successful. The Last Operation done by Foreign Forces was in Marjah City of Helmand Province in which Foreign Forces where not able to get success according to their claims. Several American and Nato Soldiers where killed in this operation while Marjah was also not completely Cleared from the Taliban. This Wednesday US Soldiers has launched another big operation in Zhari district of Kandahar Province. US Soldiers are also taking help of Air Force in the operation. Zhari is considered one of the strong hold of Taliban where they have lot of Public Support. Taliban are having fortified positions and tunnels that are having protection of minefields and bobby-trapped buildings in Zhari. 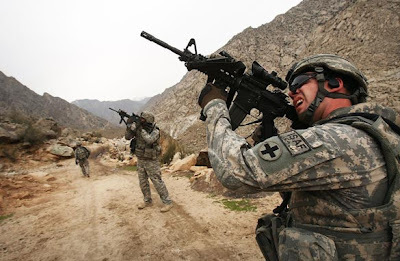 Thousands of American Soldiers are taking part in this operation and the goal is to get control of Zhari From Taliban.